Since the day it was built I have had issues with totally random freezes/hard hangs needing hard resets (no peripherals work during freeze). And just in the last week they have escalated to random restarts (no bsod). PC works absolutely fine other than that. Here is a list of troubleshooting I have tried on the unit. - I have tried with numerous forums to find help, many evet logs have been shared with no solutions. (most recent log is attached at the end of this post. - tried whocrashed to pinpoint a dumpfile indicator - I have no .dmp files to test at all indicating hardware. The only .dmp files I eventually had were due to the BSOD after repalcing GCU and the driver issue stated above - not related to the hangs freezes). I will put in the replacement GeForce today/tomorrow but I have no idea at all what the issue with crashes is. Only things left are MB/CPU/RAM or some random compatibility issue. Can anyone help? TLDR: New PC, runs great but has random crashes/freezes and now restarts (no BSOD). Very seldom and occur between 5 and 15 hours or so into boot up. Tried numerous tests and troubleshoots listed above. Event viewer has had no help but consistent errors include wininnit and custom dynamic link libraries. Can I ask if the OS on the SSD was a fresh installation, if yes what type of media was used as in a full retail/OEM disk, downloaded ISO or a burned copy etc. Please provide a link to the Ram that you have. NB: In order to receive notification of any reply to your topic you need to click on the Follow this topic tab at the upper right corner of the page. Yes, fresh install of W7 onto the SSD from the disk (professional version). The auth code for windows hasn't been used yet as I wanted to make sure I could use my old PC to troublshoot online if there were issues with my new PC. So windows does ask for the registration key still, but that's fine I can do when I'm ready. NW if you need to go sleep, thanks. Edited by Panic Drill, 22 July 2014 - 04:15 PM. Do I need to install the SATA RAID/AHCI drivers or just the chipset? I have definitely installed the chipset. Edited by Panic Drill, 22 July 2014 - 04:43 PM. While Phillpower2 is offline, I will get some more info from you , if that's OK.
You do not have to have RAID drivers installed unless you have a RAID setup. When you installed the OS, did you have other internal and the USB HDDs still connected? Don't know how recent the system specs you uploaded was generated, it shows the USB 3.0 has a problem. Are there any warning flags showing in Device Manager? Can you run a program like HWMonito or speedfan and post a screenshot? Please download and run Speccy. - When OS was installed no other devices were connected. Just the build with all parts mentioned in place. That's what you mean? Both the SATA and internal HD were in place that's it. - USB 3.0 issue could be due to one fix tried earlier in the process - some errors would be reported from previosu troubleshoot attempts. USB 3.0 I think I disabled legacy USB in BIOS as one trblsht option a few weeks ago or so ago. Is it an issue now? It isn't the cause of freezes though. - Will do another speccy for you guys, I've had other forums go over it and they havn't found anything but maybe you can idk. Will link to report soon. - There may have been issues with previous attempted fixes (but they aren't the crash cause - e.g. the only .dmp file I have on 14/7 was from replacing GCU with old one to trblsht that area). - Will also get a HM screenshot up. Posting reports soon, thanks. I fear there may be nothing obvious though. Your Ram is not on the MBs QVL however it is the same specs as an alternative G-Skill product that is so it may be ok.
Is there any reason the speedfan version I downloaded (4.49) does not give any info other than the RH side top panel? It is not measuring fans or voltages and they do not show up on the tabs. regarding the PSU - I have swapped it out and used a replacement in testing - did not solve the crashes so I put it back in. There is the odd chance I guess that both of them had the issue but the replacement unit had no troubles ever on my old PC. Edited by Panic Drill, 23 July 2014 - 01:37 PM. 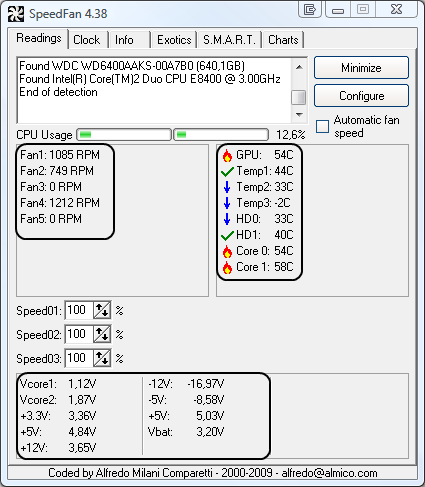 Not sure why your Speedfan readings omit the voltages. Im not fussed about the old GCU not showing up as it being replaced with the replacement GeForce tomorrow. IDK why nothing else shows up. Looks like the readings wont read correctly for some reason. Edited by Panic Drill, 23 July 2014 - 02:57 PM. 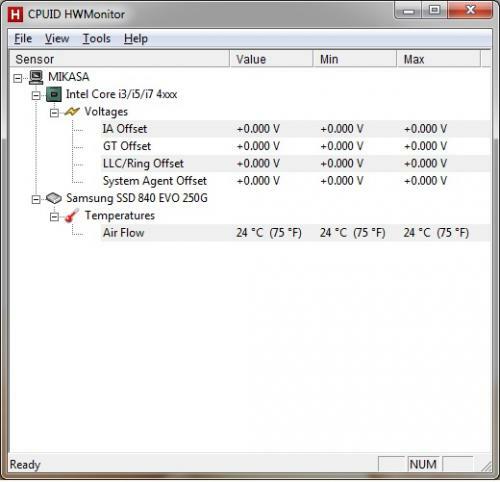 From SPeccy - these are voltages if it helps - since HWM and SF wont report it. It was the voltages in Speccy that caught my attention and why I asked for the Speedfan and HWMonitor screenshots. Can I ask why you will not attach the screenshots following the GTG method and my posted procedure. Sorry used to using onedrive with previous forums - not ingrained in my habits. I will try and figure out why speed fan and hw monitor wont report properly and hopefully fix it and post shots for you to look at. I realise it is late where you are again so hopefully I have them up tomorrow for you. No idea why they don't report but I will look into it. Edited by Panic Drill, 23 July 2014 - 03:24 PM.